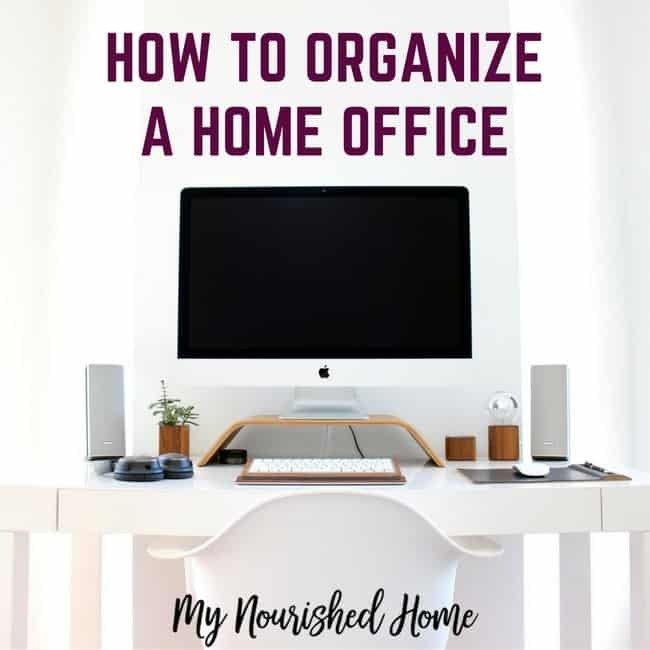 Learning how to organize a home office is important if you want to be efficient when working at home – and not have your work take over your house! A little home office organization goes a long way if you want to take control of this space! Every home office is different, it has to work for you and your family. You must assess what the function of the space is and how you want it to work! Do your children need space for homework? Do you allow your pets in the space? All these areas are important, it lets you think about what how you want the space to function and how it will work with your family. If children need to do homework and you work from home, more than one desk is a must! Because I earn a living from home, it is very challenging to have my desk as open season for exploring toddlers. It took some time, but my kids now know that mom’s desk is for her work and they are only allowed there with permission and supervision. However, when we moved a small desk in the office for them to use, they now love to draw, color and do homework (depending on their ages) while I finish up working for the day. Do you have storage in your home office? Don’t rush out and buy more storage, look at what you have, it might just need reorganizing so it works better for you. Don’t have a spare bookshelf? You don’t have to spend a ton. Check out the local yard sale. (Our community has a virtual yard sale group on Facebook!) Take that one your mom isn’t using. A cleanup and a fresh coat of paint will go a LONG way towards refreshing old furniture. If you want new furniture for your office, great! But don’t spend a lot because you think you have to! Paper is the most common item in any home office. Controlling the paperwork that you store and the paper that keeps coming in requires thought! Any system that you choose must feel comfortable to use, otherwise, you will quickly abandon it and end up in a mess! If you actually work from home, your work life and your home life are going to collide in your home office. It is important to figure out how to organize both. I have a 2 hanging baskets on the wall as you walk into my office. One for work. And one for home paperwork. (Funny how bills end up in both baskets!) But having 2 distinct inboxes lets me manage the paperwork from each area in a focused way. Don’t be afraid of a filing cabinet, just be sure to label everything, that way you can find items you are looking for so much easier! Designate the drawers as home or work. Make sure that you file the paper in the correct place after you have finished. The success of any home office may actually hedge on how the trash is dealt with! Have a trash basket for the actual trash, but don’t forget to have a place for recycling too! If you have a shredder, use it, don’t let it sit there with the shredding pile increasing with each day! Our local bank also has a “shredding day” once a month for financial paperwork. If you are going the monthly option, make sure you designate a place to store this paperwork so that it is confined and out of the way so that it doesn’t sneak back into your current paperwork – or take over your office floor. Bookcases and shelving are great for storing books and files, but those smaller items can also find a home here! Use boxes and baskets to hold together smaller items, don’t forget to label the box so you know where to find them. If you have kids in the house, make sure you secure bookshelves in case little people decide to scale them for something cool residing on the top shelf. If they hold items that are heavy remember to put them on a low shelf as you don’t want to struggle with lifting a heavy box on and off a shelf! Top heavy shelves are also more likely to tip over. Once I started spending more than 8 hours a day in my home office, I had the overwhelming desire to have this space look and feel like a place I actually wanted to hang out. We drug our old bookshelves into the driveway and gave them a coat of paint and my husband built some wall shelves that were both functional and beautiful. A nice picture on the wall and suddenly my office went from mismatched old bookshelves to a place I was actually excited to be every day. Okay, I admit, I struggle here the most. Out of site, out of mind, right? After a few months of just dumping little things in my drawers, I couldn’t find anything. Don’t just dump all those little items in your desk drawers! Find a way to keep items organized. Use a drawer organizer or little storage boxes to hold similar the items together, don’t use round containers as you will waste space! Keeping on top of the organization in your home office is so important as it can quickly become out of control! Do you need more home organization ideas? Use these brilliant methods for organizing your bedroom and these tips for organizing your closet!